For direct downloads from MediaFire, it is safer to divide the downloads into smaller segments to prevent corruption during download. For FreeMeshX, the max size for any file is 4.38 GB which the capacity of a single layer DVD. It seems some people are confused in the original instructions on how to extract all the parts correctly. It is much simpler than you probably think. For example, let’s take Asia as an example. It is 13.3 GB, and it is divided into 4 DVD-sized files. All four volumes are part of only one package. 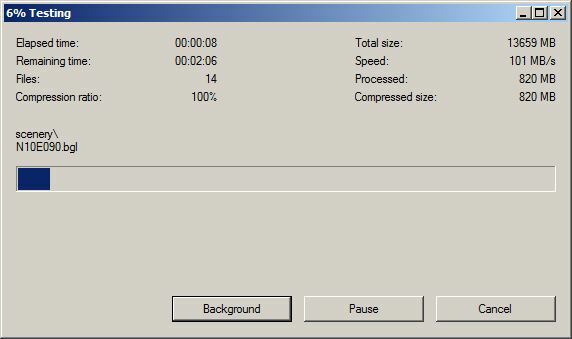 To extract, all you have to do (with 7-Zip) is extract the .001 file. By doing so, all the volumes extract seamlessly automatically. You CANNOT extract the other .002, .003, .004 volumes. You have to use 7-ZIP, which is free and open source, which can be found here. 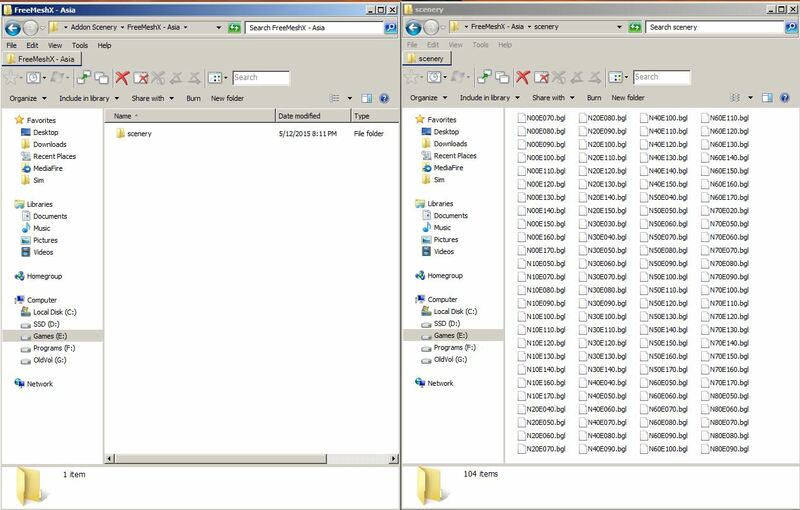 To illustrate, let’s look at the 7-ZIP File Manager as we open the .001 file, after we have placed all four parts together into a single folder. Notice, how the size of the folder is 14 323 168 371 bytes (or 13.3 GB). That is the sum of all four parts. All you have to do now is just extract once to decompress our scenery folder. 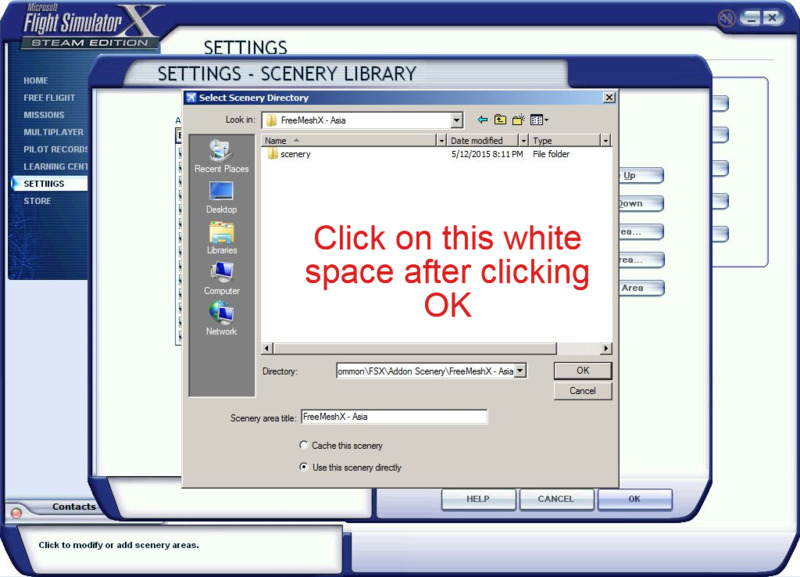 Once it finishes, put the scenery folder inside another folder with a descriptive title, such as FreeMeshX – Asia. Continue with the guide. 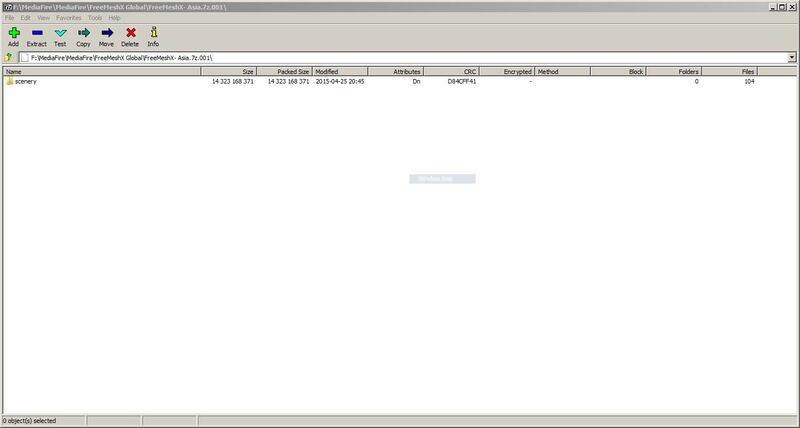 Bit torrent users don’t have to extract any archives. The data integrity checks built within Bit torrent ensures the data is also uncorrupted during download. However, after downloading (and decompressing for direct downloads), you should have a set of FreeMeshX folders, such as below. Each folder will have a scenery folder with a number of BGL files inside. This is important! The BGL files must reside in a scenery folder. So the final folder structure for both direct and Bittorrent downloads should appear as FreeMeshX – <Region>/scenery/.bgl files. Now you can put the FreeMeshX folders anywhere you want. They don’t have to be inside the FSX or Prepar3D folders. They can be placed on USB 3.0 drive, or an SSD, or a mechanical hard drive. As long as Windows can access it, then you are fine! Now all you have to do is add your FreeMeshX folders into your simulator’s scenery library. Click “Add Area…”. Here you browse to your FreeMeshX folders, and add them one at a time to the scenery library. FSX and P3D will accept any folder with a scenery folder inside. So you simply choose the FreeMeshX folders of your choice. Click OK. There is a bug in FSX where clicking OK does nothing, and may seem you are stuck. Don’t despair! Clicking anywhere any white space in the browsing menu will close the dialog window. Afterwards, your FreeMeshX folders will be installed correctly. Make sure you put the FreeMeshX – Patches folder on top for higher priority!